If you work in food service, healthcare, or other applications that require hygienic and sanitary storage, NSF certified shelving carts are a cost-effective solution that is as easy to use as it is easy to keep clean. And with its 5″ polyurethane casters, the mobile utility racks are also easy to transport across your facility for quick access. 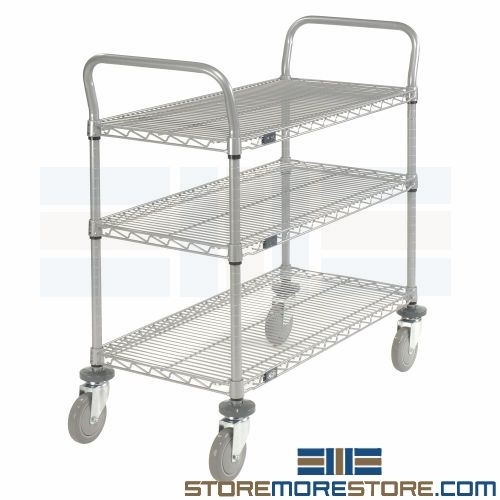 Choose from NSF certified shelving carts with wire, plastic, galvanized, or stainless steel shelves depending on your application. For example, they’re great for storing anything from food and cleaning supplies to electronics, repair parts, boxes and bins, and more. 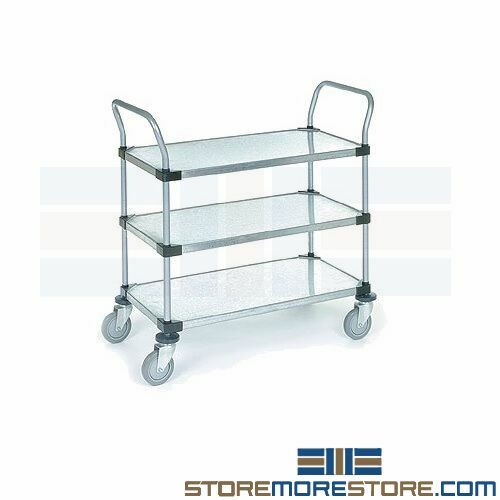 Galvanized and stainless steel carts are ideal for sanitary and heavy-duty storage since they are easy to clean and hold up to 1200 lbs., while wire and plastic shelf carts are great for general storage applications. All carts ship unassembled and are NSF listed. So why does NSF certification matter? Because the National Sanitation Foundation, or NSF, helps develop health and safety standards for consumer products and systems. NSF certification, indicated by the NSF mark, ensures that the product has been tested and complies with standard requirements for safety, design and construction, and performance. Additionally, NSF certified products only use FDA approved raw materials without harmful chemicals that could contaminate food products. When using NSF certified products, you keep consumers safe and instill more trust in your brand. NSF certified shelving carts are available to buy online and ship within 5-7 business days with free dock-to-dock shipping included. If you need any assistance or just want some help picking the right solution for you, please call us at 1-855-786-7667.